When considering pressure washing, it is vital to remember that three different elements come into play. These three elements are: the water pressure, the pressure washing soap (or detergent) used and the temperature of the water. The level of each individual element affects the process of cleaning and washing. This concept may prove difficult to gasp, especially as the process of spaying will make an old fence look as good as it did new, regardless of the set elements. When I bought my first Honda powered pressure washing kit, I immediately went off to cleanse the mold-covered privacy fence erected around our pool. In no time at all, it looked brand new. However, within only a few weeks, I found that the mold had come back. At the time, I did not realize that washing the fence would not kill the mold. It was only later did I discover that the greatest way to eliminate mildew on a fence is to mix water with oxygen bleach. Oxygen bleach actually eliminates mildew and mold and prevents future growth – at least until the end of the season. 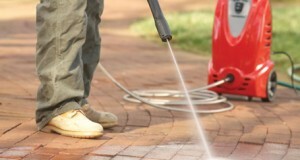 A number of commercial products or pressure washer detergent can be purchased which aid killing mold and mildew. These products are typically sprayed onto the wood before being scrubbed off or left to stand for a few minutes before being rinsed off. It is always advisable to test a cleaner in an inconspicuous place to ensure that it will not cause discoloration before you apply it to your whole deck or fence. The thing to realize about pressure washing is that this same process applies to cleaning up any grease, dirt, or any substance for that matter. Everyone knows that water and oil do not mix and just because you are in possession of a high pressured machine full of hot water does not mean that you will clear the oil from the garage floor. In these instances, you will require a detergent or special pressure washing soap made specifically for the breaking down of grease and oil. Just remember that high pressure and water alone does not mean you’re actually cleaning the surface; in fact, you may be doing more damage than good.